On 7 February AVO reported that seismic and infrasound activity from Shishaldin declined to background levels during the previous month, prompting the observatory to lower the Aviation Color Code to Green and the Volcano Alert Level to Normal. An eruption at Shishaldin that began in January 2014 was continuing as of March 2015 (BGVN 40:01). The Alaska Volcano Observatory reported increased activity on 28 January 2014 and a low-level lava eruption in the summit crater in mid-March. Thermal anomalies detected by MODIS (Moderate Resolution Imaging Spectroradiometer) satellite sensors first appeared on 30 January, but became more frequent after 4 May 2014. Thermal data processed by MODVOLC detected anomalies up to 12 May 2015 (figure 10), but none after that through March 2016. Anomalies determined by MIROVA (Middle InfroRed Observation of Volcanic Activity) showed continuing activity through late August 2015 (figure 11). Figure 10. MODVOLC Thermal Alerts measured over Shishaldin volcano on Unimak Island, 30 January 2014-24 January 2015. Over this time there were 47 anomalies, with the most occurring in July (10), October (9), and November (8) 2014. Similar activity at the summit area continued to generate alerts through 12 May 2015. Each pixel represents a measured thermal alert for an area slightly larger than 1.5 km2. Courtesy of HIGP MODVOLC Thermal Alerts System. Figure 11. Measured volcano radiative power for Shishaldin volcano for the year April 2015 through March 2016. The discontinuous nature of the anomalies may be due to atmospheric conditions rather than intermittent activity at the volcano. The data points in November 2015 are not at the summit; the source of those in December are unknown. Courtesy of MIROVA. The Alaska Volcano Observatory (AVO) reported that from January to November 2015, seismicity continued to be slightly elevated over background levels, indicating that low-level eruptive activity confined to the summit crater continued. Minor steaming from the summit was often observed, and on several dates steam and ash plumes were observed over the summit. During this time, the Aviation Color Code was at Orange and the volcanic Alert Level was at Watch. No anomalous activity was observed in satellite data after weakly elevated surface temperatures were detected on 16 October 2015. In addition, low-amplitude seismic tremor continued but was likely not indicative of a continuing eruption. The Aviation Color Code was lowered to Yellow and the Volcano Alert Level was lowered to Advisory. On 10 March 2016, AVO reported that there had been a continual decrease in thermal activity over the past several months; no anomalous activity had been observed in several clear satellite images since 13 January, when moderately elevated surface temperatures were detected. Airwaves generated by low-level explosive degassing had not been detected in infrasound data since 7 February. Low-amplitude seismic tremor was at background levels. In March 2016 the Color Code was lowered to Green and the Alert Level was lowered to Normal. AVO reported that seismic and infrasound data from Shishaldin continued to indicate elevated activity during 13-19 December. Robust steaming was recorded by a webcam during 13-14 December; ice and poor weather conditions prevented views during the rest of the period. The Aviation Color Code remained at Yellow and the Volcano Alert Level remained at Advisory. On 10 March AVO reported that there had been a continual decrease in thermal activity at Shishaldin over the past several months; no anomalous activity had been observed in several clear satellite images since 13 January, when moderately elevated surface temperatures were detected. Airwaves generated by low-level explosive degassing had not been detected in infrasound data since 7 February. Low-amplitude seismic tremor was at background levels. The Aviation Color Code was lowered to Green and the Volcano Alert Level was lowered to Normal. AVO reported that no anomalous activity at Shishaldin had been observed in satellite data since weakly elevated surface temperatures were detected on 16 October. In addition, low-amplitude seismic tremor continued but was likely not indicative of a continuing eruption. The Aviation Color Code was lowered to Yellow and the Volcano Alert Level was lowered to Advisory. AVO reported that seismicity at Shishaldin continued to be slightly elevated over background levels during 11-17 November, indicating that low-level eruptive activity confined to the summit crater continued. The Aviation Color Code remained at Orange and the Volcano Alert Level remained at Watch. AVO reported that seismicity at Shishaldin continued to be slightly elevated over background levels during 4-10 November, indicating that low-level eruptive activity confined to the summit crater continued. The Aviation Color Code remained at Orange and the Volcano Alert Level remained at Watch. AVO reported that seismicity at Shishaldin continued to be slightly elevated over background levels during 28 October-2 November, indicating that low-level eruptive activity confined to the summit crater continued. The Aviation Color Code remained at Orange and the Volcano Alert Level remained at Watch. AVO reported that seismicity at Shishaldin continued to be slightly elevated over background levels during 21-27 October, indicating that low-level eruptive activity confined to the summit crater continued. The Aviation Color Code remained at Orange and the Volcano Alert Level remained at Watch. AVO reported that seismicity at Shishaldin continued to be elevated over background levels during 14-20 October, indicating that low-level eruptive activity confined to the summit crater continued. Cloud cover often prevented satellite and webcam observations; weakly elevated surface temperatures were detected in satellite images on 16 October. The Aviation Color Code remained at Orange and the Volcano Alert Level remained at Watch. AVO reported that seismicity at Shishaldin continued to be elevated over background levels during 7-13 October, indicating that low-level eruptive activity confined to the summit crater continued. Cloud cover often prevented satellite and webcam observations; minor steam emissions were visible on 7 October, and weakly elevated surface temperatures were detected in satellite images during 7-8 October. The Aviation Color Code remained at Orange and the Volcano Alert Level remained at Watch. AVO reported that seismicity at Shishaldin continued to be elevated over background levels during 30 September-4 October, indicating that low-level eruptive activity confined to the summit crater continued. Cloud cover often prevented satellite and webcam observations. The Aviation Color Code remained at Orange and the Volcano Alert Level remained at Watch. AVO reported that seismicity at Shishaldin was only slightly above background levels during 16-22 September. No activity was observed in satellite or webcam images during clear periods. The Aviation Color Code remained at Orange and the Volcano Alert Level remained at Watch. AVO reported that seismicity at Shishaldin continued to be elevated over background levels during 9-15 September, indicating that low-level eruptive activity confined to the summit crater continued. The Aviation Color Code remained at Orange and the Volcano Alert Level remained at Watch. AVO reported that seismicity at Shishaldin continued to be elevated over background levels during 2-8 September, indicating that low-level eruptive activity confined to the summit crater continued. Cloud cover often prevented satellite and webcam observations; elevated surface temperatures were periodically detected in satellite images. The Aviation Color Code remained at Orange and the Volcano Alert Level remained at Watch. AVO reported that seismicity at Shishaldin continued to be elevated over background levels during 26 August-1 September, indicating that low-level eruptive activity confined to the summit crater continued. Cloud cover often prevented satellite and webcam observations; elevated surface temperatures were periodically detected in satellite images. The Aviation Color Code remained at Orange and the Volcano Alert Level remained at Watch. AVO reported that on 18 August a field crew conducting gas measurements at Shishaldin observed a low-level plume from the summit drifting several kilometers downwind. Seismicity continued to be elevated over background levels during 19-25 August indicating that low-level eruptive activity confined to the summit crater continued. Cloud cover mostly prevented satellite and webcam observations; elevated surface temperatures were occasionally detected in satellite images. The Aviation Color Code remained at Orange and the Volcano Alert Level remained at Watch. AVO reported that seismicity at Shishaldin continued to be elevated over background levels during 12-18 August, indicating that low-level eruptive activity confined to the summit crater continued. Cloud cover mostly prevented satellite and webcam observations; elevated surface temperatures were detected in satellite images on 13 August. The Aviation Color Code remained at Orange and the Volcano Alert Level remained at Watch. AVO reported that seismicity at Shishaldin continued to be elevated over background levels during 5-11 August indicating that low-level eruptive activity confined to the summit crater continued. Cloud cover sometimes prevented satellite and webcam observations; elevated surface temperatures were sometimes detected in satellite images and steaming from the crater was occasionally recorded by the webcam. The Aviation Color Code remained at Orange and the Volcano Alert Level remained at Watch. AVO reported that seismicity at Shishaldin continued to be elevated over background levels 28 July-4 August indicating that low-level eruptive activity confined to the summit crater continued. Cloud cover sometimes prevented satellite and webcam observations; elevated surface temperatures were sometimes detected in satellite images. Satellite images detected a 24-km-long steam plume drifting SE on 28 July and vigorous steaming and plumes drifting SW on 31 July. A steam plume was recorded by the webcam on 2 August. The Aviation Color Code remained at Orange and the Volcano Alert Level remained at Watch. AVO reported that seismicity at Shishaldin continued to be elevated over background levels 15-21 July indicating that low-level eruptive activity confined to the summit crater likely continued. Cloud cover prevented satellite and webcam observations. Elevated surface temperatures were detected in satellite images during 19-20 July. The Aviation Color Code remained at Orange and the Volcano Alert Level remained at Watch. AVO reported that seismicity at Shishaldin continued to be elevated over background levels 8-14 July indicating that low-level eruptive activity confined to the summit crater likely continued. Cloud cover prevented satellite and webcam observations. The Aviation Color Code remained at Orange and the Volcano Alert Level remained at Watch. AVO reported that seismicity at Shishaldin continued to be elevated over background levels 1-7 July indicating that low-level eruptive activity confined to the summit crater likely continued. Although cloud cover often prevented visual observations, webcam images showed periodic steaming, and ash at the summit during 2-3 July. Elevated surface temperatures at the summit were detected in satellite images on 3 and 7 July. The Aviation Color Code remained at Orange and the Volcano Alert Level remained at Watch. AVO reported that seismicity at Shishaldin continued to be elevated over background levels 24-30 June, indicating that low-level eruptive activity confined to the summit crater likely continued. Elevated surface temperatures were periodically detected in satellite images. Webcam images showed ash deposits around the summit crater rim on 29 and 30 June. The Aviation Color Code remained at Orange and the Volcano Alert Level remained at Watch. AVO reported that seismicity at Shishaldin continued to be elevated over background levels 17-23 June, indicating that low-level eruptive activity confined to the summit crater likely continued. Elevated surface temperatures were periodically detected in satellite images, and minor steaming was recorded by the webcam. On 18 June pilot and satellite observations indicated a weak ash plume rising around 100 m above the summit crater, resulting in ash deposits on the upper flanks. Weak ash emissions were also visible with the webcam the next day. The Aviation Color Code remained at Orange and the Volcano Alert Level remained at Watch. AVO reported that seismicity at Shishaldin continued to be elevated over background levels 10-16 June indicating that low-level eruptive activity confined to the summit crater likely continued. Elevated surface temperatures were periodically detected in satellite images, and minor steaming was recorded by the webcam. The Aviation Color Code remained at Orange and the Volcano Alert Level remained at Watch. AVO reported that seismicity at Shishaldin continued to be elevated over background levels during 3-9 June, indicating that low-level eruptive activity confined to the summit crater likely continued. Elevated surface temperatures were periodically detected in satellite images, and minor steaming was recorded by the webcam. The Aviation Color Code remained at Orange and the Volcano Alert Level remained at Watch. AVO reported that seismicity at Shishaldin continued to be elevated over background levels 27 May-2 June, indicating that low-level eruptive activity confined to the summit crater likely continued. Elevated surface temperatures were periodically detected in satellite images, and minor steaming was recorded by the webcam during 27-28 May. The Aviation Color Code remained at Orange and the Volcano Alert Level remained at Watch. AVO reported that seismicity at Shishaldin continued to be elevated over background levels 20-26 May indicating that low-level eruptive activity confined to the summit crater likely continued. Elevated surface temperatures were periodically detected in satellite images. The Aviation Color Code remained at Orange and the Volcano Alert Level remained at Watch. AVO reported that seismicity at Shishaldin continued to be elevated over background levels 13-19 May, indicating that low-level eruptive activity confined to the summit crater likely continued. On 15 May a low-level vigorous gas-and-steam plume possibly containing ash was recorded by the webcam. Elevated surface temperatures were detected in satellite images. The Aviation Color Code remained at Orange and the Volcano Alert Level remained at Watch. AVO reported that seismicity at Shishaldin continued to be elevated over background levels 6-12 May indicating that low-level eruptive activity confined to the summit crater likely continued. Periodically, elevated temperatures in the crater were detected and steaming was recorded by the webcam, although cloud cover sometimes prevented views of the volcano. The Aviation Color Code remained at Orange and the Volcano Alert Level remained at Watch. AVO reported that seismicity at Shishaldin continued to be elevated over background levels 22-28 April, indicating that low-level eruptive activity confined to the summit crater likely continued. Cloud cover frequently prevented satellite and webcam observations. Slight steaming was recorded by the webcam on 26 April and elevated temperatures were detected in satellite images during 27-28 April. The Aviation Color Code remained at Orange and the Volcano Alert Level remained at Watch. AVO reported that seismicity at Shishaldin continued to be elevated over background levels 15-21 April indicating that low-level eruptive activity confined to the summit crater likely continued. Cloud cover frequently prevented satellite and webcam observations. On 16 April the webcam periodically recorded a white steam plume rising about 500 m above the summit. Several pilot reports indicated ash emissions, prompting a SIGMET, however no ash was visible in satellite or webcam images, and seismicity remained unchanged. The Aviation Color Code remained at Orange and the Volcano Alert Level remained at Watch. AVO reported that seismicity at Shishaldin continued to be elevated over background levels during 8-14 April. They interpreted those data as indicating that low-level eruptive activity confined to the summit crater likely continued. Cloud cover frequently prevented satellite and webcam observations. The Aviation Color Code remained at Orange and the Volcano Alert Level remained at Watch. AVO reported that seismicity at Shishaldin continued to be elevated over background levels during 1-7 April indicating that low-level eruptive activity confined to the summit crater likely continued. Highly elevated surface temperatures in the crater were detected during 1-3 April, suggesting the presence of lava within the crater. The Aviation Color Code remained at Orange and the Volcano Alert Level remained at Watch. AVO reported that seismicity at Shishaldin continued to be elevated over background levels during 25-31 March, indicating that low-level eruptive activity confined to the summit crater likely continued. Nothing significant was observed in partly-to-mostly cloudy satellite and web camera images. Vigorous steaming at the summit was visible during 28 and 30-31 March; steam plumes, also reported by a pilot, rose several hundred feet above the crater on 30 March, and on 31 March observers on a Coast Guard ship reported that a steam-rich plume drifted 15-30 km S. The Aviation Color Code remained at Orange and the Volcano Alert Level remained at Watch. AVO reported that seismicity at Shishaldin continued to be elevated over background levels during 11-17 March, indicating that low-level eruptive activity confined to the summit crater likely continued. Minor steaming from the summit was observed in webcam images on 11 March. The Aviation Color Code remained at Orange and the Volcano Alert Level remained at Watch. AVO reported that seismicity at Shishaldin continued to be elevated over background levels during 4-10 March. Elevated surface temperatures were sometimes detected in satellite images. Low-level eruptive activity confined to the summit crater likely continued. The Aviation Color Code remained at Orange and the Volcano Alert Level remained at Watch. AVO reported that seismicity at Shishaldin continued to be elevated over background levels during 25 February-3 March. Elevated surface temperatures, sometimes that were highly elevated, were detected in satellite images almost daily. The webcam recorded minor degassing on 25 February and a low-level plume during 28 February-1 March. Low-level eruptive activity confined to the summit crater likely continued. The Aviation Color Code remained at Orange and the Volcano Alert Level remained at Watch. AVO reported that seismicity at Shishaldin continued to be elevated over background levels during 18-24 February. Cloud cover often prevented webcam and satellite-image views of the volcano. Weakly elevated surface temperatures were detected in satellite images during 22-24 February. Low-level eruptive activity confined to the summit crater likely continued. The Aviation Color Code remained at Orange and the Volcano Alert Level remained at Watch. AVO reported that seismicity at Shishaldin continued to be elevated over background levels during 11-17 February. Elevated surface temperatures were observed in satellite images on most days, and minor steam emissions were recorded by the web cam on 11 February. Low-level eruptive activity confined to the summit crater likely continued. The Aviation Color Code remained at Orange and the Volcano Alert Level remained at Watch. AVO reported that seismicity at Shishaldin continued to be slightly elevated over background levels during 4-10 February. Elevated surface temperatures were observed in satellite images on most days, and minor steam emissions were recorded by the web cam during 6-9 February. Low-level eruptive activity confined to the summit crater likely continued. The Aviation Color Code remained at Orange and the Volcano Alert Level remained at Watch. AVO reported that seismicity at Shishaldin continued to be slightly elevated over background levels during 28 January-3 February. Nothing significant was observed in mostly cloudy satellite and web camera images, although minor steaming from the summit was recorded by the webcam during 30 January-3 February. During 31 January-3 February elevated surface temperatures were observed in satellite images, and during 1-2 February low-level ash emissions drifted WSW. The Aviation Color Code remained at Orange and the Volcano Alert Level remained at Watch. AVO reported that on 21 January webcam images taken in partly cloudy conditions at Shishaldin possibly showed a dusting of fresh ash on the snowy upper flanks. During 21-22 January seismicity continued to be slightly elevated over background levels. Strongly elevated temperatures at the summit detected in overnight satellite images were consistent with possible lava in the crater. Clear webcam views during 23-25 January showed a small steam plume, indicating that the current activity was mostly contained in the deep summit crater. The Aviation Color Code remained at Orange and the Volcano Alert Level remained at Watch. AVO reported that seismicity at Shishaldin continued to be slightly elevated over background levels during 14-20 January. Nothing significant was observed in clear-to-cloudy satellite and web camera images, although weakly elevated temperatures were detected in one satellite image on two different days. The Aviation Color Code remained at Orange and the Volcano Alert Level remained at Watch. AVO reported that seismicity at Shishaldin continued to be slightly elevated over background levels during 7-13 January. Nothing significant was observed in clear-to-partly cloudy satellite and web camera images. In a report from 9 January AVO noted that a small number of air-pressure waves from minor explosions within the summit crater were detected in seismic data intermittently during the previous week; there was no evidence of ash emissions outside of the crater. The Aviation Color Code remained at Orange and the Volcano Alert Level remained at Watch. AVO reported that seismicity at Shishaldin continued to be slightly elevated over background levels during 31 December-6 January. Nothing significant was observed in partly-to-mostly cloudy satellite and web camera images. Minor steam emissions were occasionally recorded by the webcam. The Aviation Color Code remained at Orange and the Volcano Alert Level remained at Watch. AVO reported that seismicity at Shishaldin continued to be slightly elevated over background levels during 23-30 December. Nothing significant was observed in partly-to-mostly cloudy satellite and web camera images. The Aviation Color Code remained at Orange and the Volcano Alert Level remained at Watch. AVO reported that seismicity at Shishaldin continued to be elevated during 17-23 December. Nothing significant was observed in partly-to-mostly cloudy satellite and web camera images. Occasional steam emissions were recorded by the web camera. The Aviation Color Code remained at Orange and the Volcano Alert Level remained at Watch. AVO reported that seismicity at Shishaldin continued to be elevated during 10-16 December. Nothing significant was observed in partly-to-mostly cloudy satellite and web camera images. A low-level lava eruption was likely still occurring within the summit crater of the volcano. The Aviation Color Code remained at Orange and the Volcano Alert Level remained at Watch. AVO reported that seismicity at Shishaldin continued to be elevated during 3-9 December. Thermal anomalies were often detected in satellite images during periods of clear weather. Webcam images on 9 December showed minor steam emissions. A low-level lava eruption was likely still occurring within the summit crater of the volcano. The Aviation Color Code remained at Orange and the Volcano Alert Level remained at Watch. AVO reported that although seismicity at Shishaldin continued to be elevated, levels declined during 26 November-2 December. Elevated crater temperatures were detected in satellite images during periods of clear weather from 26 to 28 November. A low-level lava eruption was likely still occurring within the summit crater of the volcano. The Aviation Color Code remained at Orange and the Volcano Alert Level remained at Watch. AVO reported that intermittent volcanic tremor at Shishaldin continued to be detected during 19-23 November. Elevated crater temperatures were detected in satellite images during periods of clear weather; thermal anomalies were reported during 21-22 November. Seismic activity increased sharply on 24 November, suggesting that the eruption had intensified. Strong thermal anomalies near the summit were detected in satellite images. On 25 November seismicity remained elevated and strongly elevated surface temperatures continued to be detected in satellite images. The Aviation Color Code remained at Orange and the Volcano Alert Level remained at Watch. AVO reported that seismicity at Shishaldin remained elevated during 12-18 November. Elevated crater temperatures were detected in satellite images during periods of clear weather. The Aviation Color Code remained at Orange and the Volcano Alert Level remained at Watch. AVO reported that seismicity at Shishaldin remained elevated during 5-11 November. Satellite and webcam views showed nothing unusual; temperatures at the summit were elevated on 5 November. The Aviation Color Code remained at Orange and the Volcano Alert Level remained at Watch. AVO reported that mostly cloudy satellite and webcam views showed nothing unusual at Shishaldin during 29 October-4 November, although the low-level eruptive activity continued. Periods of tremor were detected and overall seismicity remained elevated. The Aviation Color Code remained at Orange and the Volcano Alert Level remained at Watch. AVO reported that partly cloudy satellite images and mostly cloudy webcam views showed nothing unusual at Shishaldin during 21-24 October. Seismicity increased on 25 October, and was followed by a tremor event and elevated surface temperatures detected at the summit in satellite images. Tephra deposits at the summit were noted in clear webcam images on 26 October, indicating that the event was energetic enough to eject material onto the flank from a depth of several hundred meters within the summit crater. The Aviation Color Code remained at Orange and the Volcano Alert Level remained at Watch. AVO reported that, although cloud cover often obscured views of Shishaldin during 15-21 October, seismicity indicated that a low-level eruption was likely continuing. Elevated surface temperatures at the summit were periodically detected in cloud-free satellite images. Tremor and ground-coupled airwaves from small explosions were occasionally detected in seismic data. The Aviation Color Code remained at Orange and the Volcano Alert Level remained at Watch. AVO reported that, although cloud cover often obscured views of Shishaldin during 8-14 October, seismicity indicated a low-level eruption was likely continuing. Strongly elevated surface temperatures at the summit were periodically detected in cloud-free satellite images during 10-11 and 13-14 October. Tremor and ground-coupled airwaves from small explosions were occasionally detected in seismic data. The Aviation Color Code remained at Orange and the Volcano Alert Level remained at Watch. AVO reported that seismicity at Shishaldin indicated that a low-level eruption likely continued during 1-7 October. Strongly elevated surface temperatures at the summit were periodically detected in satellite images; cloud cover sometimes obscured satellite and webcam observations. The Aviation Color Code remained at Orange and the Volcano Alert Level remained at Watch. AVO reported that, although cloud cover sometimes obscured views of Shishaldin during 24-30 September, seismicity indicated that a low-level eruption was possibly continuing. Elevated surface temperatures at the summit were periodically detected in satellite images. The Aviation Color Code remained at Orange and the Volcano Alert Level remained at Watch. AVO reported that, although cloud cover sometimes obscured views of Shishaldin during 17-22 September, seismicity indicated that a low-level eruption was possibly continuing. Elevated surface temperatures at the summit were periodically detected in satellite images. Minor steam emissions were recorded by the web cam on 17 September. The Aviation Color Code remained at Orange and the Volcano Alert Level remained at Watch. AVO reported that low-level seismicity and eruptive activity continued from Shishaldin during 10-16 September. Observations were frequently restricted due to cloudy conditions, although elevated temperatures were observed on 15 September in one satellite image. AVO reported that low-level seismicity and eruptive activity continued from Shishaldin during 3-7 September. When weather conditions were favorable, satellite images detected elevated surface temperatures. Observations were restricted on 8-9 September due to cloudy conditions. AVO reported that during 27 August-2 September low-level eruptive activity continued at Shishaldin volcano. On 28 August a thermal feature was observed and on 31 August a small steam plume was seen in satellite images. During clear weather on 1 September no activity was observed. On 2 September elevated surface temperatures at the summit crater were noted from satellite data. Clouds prevented observations the other days of the week. The Aviation Color Code remained at Orange and the Volcano Alert Level remained at Watch. AVO reported that during 20-26 August low-level eruptive activity continued at Shishaldin volcano. A steam and gas plume was visible in web camera and satellite images occasionally during the week. On 20 August satellite images showed a steam plume extending 60 km N of the volcano. On 23 August a pilot reported a steam-and-ash plume rose about 300 m (1,000 ft) above the summit and drifted NE. On 20-22 and 26 August elevated surface temperatures at the summit were detected in clear satellite views. Infrasound sensors located in Dillingham and on Akutan Island detected sound waves from the direction of Shishaldin that were consistent with low-level eruptive activity. No significant activity noted in seismic data. The Aviation Color Code remained at Orange and the Volcano Alert Level remained at Watch. AVO reported that during 13-19 August eruptive activity continued at Shishaldin volcano. Infrasound sensors located at Dillingham and on Akutan Island detected sound waves from the direction of Shishaldin that are consistent with low-level activity at the volcano. On 13 August a pilot reported a low-level plume from Shishaldin. On the evening of 16 August web camera views showed a steam and gas plume. On 17-19 August elevated surface temperatures were detected in partly cloudy satellite views. Other days satellite and web camera views were obscured by weather. No significant activity was noted in seismic data. The Aviation Color Code remained at Orange and the Volcano Alert Level remained at Watch. AVO reported that during 6-12 August low-level eruptive activity continued at Shishaldin volcano. Web camera and satellite images showed the volcano was mostly cloudy over the past week, but intermittent web camera views showed a steam plume above the summit. On 9-10 August sound waves were detected from the direction of Shishaldin on infrasound sensors in Dillingham, consistent with the low-level activity. On 10 August an area of hot, glowing material was observed in the crater during an overflight of the Shishaldin summit. On 11 August elevated surface temperatures were observed in the summit crater. The Aviation Color Code remained at Orange and the Volcano Alert Level remained at Watch. AVO reported that during 30 July-5 August low-level eruptive activity continued at Shishaldin volcano. Elevated surface temperatures at the summit were detected from satellite data most days except for cloudy conditions 4-5 August. Steaming from the summit crater was visible in web cam images 30 July-1 August and 5 August. The Aviation Color Code remained at Orange and the Volcano Alert Level remained at Watch. AVO reported that during 23-29 July low-level eruptive activity continued at Shishaldin volcano. Elevated surface temperatures at the summit were detected daily from satellite data. On 26 July satellite and web camera images showed trace dustings of ash over fresh snow in the immediate vicinity of the crater. Web camera images showed short dark streaks of possible debris flow deposits extending from the summit crater on the southeast flank, possibly the result of the melting of snow and ice near the summit due to the increased temperatures in the vicinity of the crater. Web camera and satellite images were mostly obscured due to clouds other days. The Aviation Color Code remained at Orange and the Volcano Alert Level remained at Watch. AVO reported that during 16-22 July low-level eruptive activity continued at Shishaldin volcano. Elevated surface temperatures at the summit were detected from satellite data daily, slightly increasing 18 July. Steaming from the summit crater was visible in satellite imagery on 16 July. Web-camera images were mostly obscured due to clouds. The Aviation Color Code remained at Orange and the Volcano Alert Level remained at Watch. AVO reported that during 2-15 July low-level seismicity continued at Shishaldin volcano. Elevated surface temperatures at the summit were detected. A steam and gas plume was intermittently visible rising from the summit and drifting downwind, although satellite and web-camera images were mostly obscured due to clouds. On 9 July small explosions, probably within the summit cone, were detected on seismic and infrasound networks. The Aviation Color Code remained at Orange and the Volcano Alert Level remained at Watch. AVO reported that during 25 June – 1 July, low-level seismicity continued at Shishaldin volcano. Elevated surface temperatures at the summit were detected. A steam and gas plume was intermittently visible rising from the summit and drifting downwind, although satellite and web-camera images have been mostly cloudy. The Aviation Color Code remained at Orange and the Volcano Alert Level remained at Watch. AVO reported that Shishaldin’s low-level eruptive activity continued during 18-23 June and elevated surface temperatures were detected in satellite data (20-23 June). The volcano was frequently obscured by clouds and fog, but minor low-level steam plumes were observed in web camera images. The Aviation Color Code remained at Orange and the Volcano Alert Level remained at Watch. AVO reported that, although cloudy conditions frequently obscured webcam and satellite views of Shishaldin during 11-16 June, seismicity indicated that the low-level eruption continued. Strongly elevated surface temperatures at the summit were detected in satellite data on the morning of 16 June. The Aviation Color Code remained at Orange and the Volcano Alert Level remained at Watch. AVO reported that, although cloud cover frequently obscured views of Shishaldin during 4-9 June, seismicity indicated that the low-level eruption continued. Elevated surface temperatures at the summit were detected in mostly cloudy satellite images during 7-9 June. The Aviation Color Code remained at Orange and the Volcano Alert Level remained at Watch. AVO reported that on most days during 21-27 May elevated surface temperatures at Shishaldin's summit were detected in satellite images, and minor steam emissions were observed in webcam images on 21 May. Cloud cover often prevented observations. Seismometers near the volcano detected brief explosion signals during 21-26 May. The Aviation Color Code remained at Orange and the Volcano Alert Level remained at Watch. AVO reported that during 14-20 May elevated surface temperatures at Shishaldin's summit were detected in satellite images, and minor steam emissions were observed in webcam images. A report from 16 May noted that dark ash-covered snow near the summit was visible on an unspecified day during the past week. Seismometers near the volcano detected brief explosion signals during 17-20 May. The Aviation Color Code remained at Orange and the Volcano Alert Level remained at Watch. AVO reported that although cloud cover occasionally prevented web-cam and satellite observations of Shishaldin's summit area during 30 April-6 May, periods of elevated surface temperatures and minor steaming were observed. The Aviation Color Code remained at Orange and the Volcano Alert Level remained at Watch. AVO reported that although cloud cover occasionally prevented web-cam and satellite observations of Shishaldin's summit area during 23-29 April, periods of elevated surface temperatures and minor steaming were observed. No significant changes were detected in seismic data. The Aviation Color Code remained at Orange and the Volcano Alert Level remained at Watch. AVO reported that although cloud cover often prevented web-cam and satellite observations of Shishaldin's summit area during 16-22 April, weakly elevated surface temperatures and minor steaming were occasionally observed. No significant changes were detected in seismic data. The Aviation Color Code remained at Orange and the Volcano Alert Level remained at Watch. AVO reported that elevated surface temperatures over Shishaldin's summit area were detected in satellite images on most days during 9-15 April; cloud cover occasionally prevented observations. Ground-coupled air waves from small explosions detected by the seismic network decreased during 9-10 April. Minor ash deposits were observed several hundred meters down flanks. The Aviation Color Code remained at Orange and the Volcano Alert Level remained at Watch. AVO reported that elevated surface temperatures over Shishaldin's summit area were detected in satellite images during 2-8 April. No activity was detected in the seismic data. The webcam showed a steam plume rising from the crater on 6 April. The Aviation Color Code remained at Orange and the Volcano Alert Level remained at Watch. AVO reported that no activity from Shishaldin was observed in party-to-mostly-cloudy satellite images during 12-18 February. The nearest working seismic station detected low seismicity. The Aviation Color Code remained at Yellow and the Volcano Alert Level remained at Advisory. AVO reported that elevated surface temperatures in Shishaldin's summit crater were detected in satellite images during 5-6 February. No unusual seismicity was detected by the nearest working station off the flanks of the volcano. A possible ash-poor gas cloud was detected in satellite images beginning at 0645 on 7 February that may have been from a small explosion, too small to be detected by the seismometer but coinciding with a local tiltmeter signal. Satellite image analysis suggested that the short-lived cloud may have risen to an altitude of 7.6 km (25,000 ft) a.s.l. Elevated surface temperatures were not detected after the event, so very little if any hot material was ejected. During 9-11 February elevated surface temperatures were detected in satellite images and a tiltmeter 5.4 km SW of the volcano recorded a small signal. Clear or partly clear web cam images showed no activity. The Aviation Color Code remained at Yellow and the Volcano Alert Level remained at Advisory. On 30 January, AVO raised the Aviation Color Code for Shishaldin to Yellow and the Volcano Alert Level to Advisory based on increased surface temperatures detected at the summit crater by satellite images over the previous few days, as well as increased steam emissions observed on 29 January in satellite and web-camera images. No steam emissions were observed during 30-31 January. Elevated surface temperatures were again detected on 1 February. On 19 October, AVO reported that recent clear satellite views of Shishaldin showed no activity; the last thermal anomaly was detected on 16 August. Seismicity was variable, but within background levels. The Aviation Color Code was lowered to Green and the Volcano Alert Level was lowered to Normal. On 10 July, AVO reported that a distinct thermal anomaly in Shishaldin's summit crater observed intermittently since January 2009 became more intense during the previous month. AVO raised the Aviation Color Code to Yellow and the Volcano Alert Level to Advisory. AVO also noted that seismicity had not increased, deformation was unchanged, and satellite observations showed no significant sulfur dioxide gas emissions. Some reports of steaming from the summit crater were received. AVO reported that seismic activity from Shishaldin had returned to background levels in December 2008 and remained low. On 3 February, a weak thermal anomaly was detected on satellite imagery. The Aviation Color Code was lowered to Green and the Volcano Alert Level was lowered to Normal on 11 February. AVO reported that thermal anomalies over Shishaldin's summit were detected in satellite imagery during 7-10 January. Clouds prevented observations on 11, 12, and 13 January. The Aviation Color Code remained at Yellow and the Volcano Alert Level remained at Advisory. AVO reported that significant thermal anomalies over Shishaldin's summit were detected in satellite imagery during 5-6 January. Seismic activity had also increased slightly. AVO raised the Aviation Color Code to Yellow and the Volcano Alert Level to Advisory. On 26 October, AVO lowered the Concern Color Code at Shishaldin from Yellow to Green. Volcanic tremor at the volcano had remained at a relatively constant and low level for more than a month. No new satellite observations indicative of significant activity in the summit crater had been received by AVO, and there had been no recent reports of ash emissions or ash on the snow near the summit. The low-level seismic tremor that continued to be recorded at the volcano was considered to be representative of the background rate of activity at Shishaldin. Low-level seismic tremor continued to be recorded at Shishaldin during 10-17 September. This level of activity is similar to that observed over the past several months. Shishaldin remained at Concern Color Code Yellow. Low-level seismic tremor continued at Shishaldin during 22-30 July as it had for several months. On 24 July an AVO field crew observed vigorous steaming at the summit and what may have been ash deposits on the volcano's upper slopes. Shishaldin remained at Concern Color Code Yellow. Low-level seismic activity characterized by weak but continuous tremor continued at Shishaldin during 7-13 July. No volcanic activity was observed at the volcano during clear weather, but AVO reported that satellite data indicated the crater to be warmer than the surrounding ground surface. Shishaldin remained at Concern Color Code Yellow. Seismic unrest continued at Shishaldin during 18-25 June, with weak tremor and occasional discrete low-frequency earthquakes occurring. 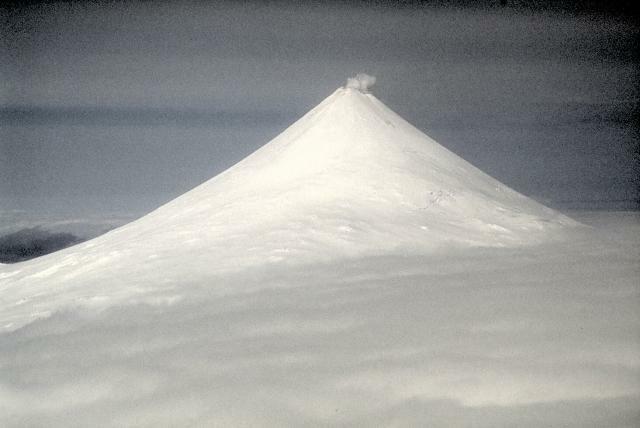 A pilot reported seeing steam rise to low levels above Shishaldin's cone. Around that time, a possible weak thermal anomaly was visible on satellite imagery. Shishaldin remained at Concern Color Code Yellow. Seismic unrest continued at Shishaldin during 21-28 May. It was characterized by weak seismic tremor and occasional discrete low-frequency earthquakes. Meteorological clouds obscured views of the volcano. Shishaldin remained at Concern Color Code Yellow. During 14-21 May seismic unrest continued at Shishaldin, characterized by weak seismic tremor and small explosions. On 16 May, a pilot reported an ash plume that rose ~300 m above the volcano's summit. Satellite imagery from 17 May showed a vigorous plume emanating from the summit that may have contained small amounts of ash. Shishaldin remained at Concern Color Code Yellow. During 7-14 May seismic unrest continued at Shishaldin, characterized by sequences of volcanic earthquakes, small explosions, and seismic tremor. A weak thermal anomaly observed at Shishaldin's summit on 11 May was similar to those detected occasionally since January 2004. Shishaldin remained at Concern Color Code Yellow. Seismic unrest continued at Shishaldin during 30 April to 7 May. It was characterized by sequences of volcanic earthquakes and seismic tremor. The number of airwaves recorded by the seismic network diminished in comparison to the previous week, but weaker signals were recorded. Thermal anomalies at the summit were observed on satellite imagery under optimal viewing conditions. Retrospective analysis confirmed that these data, as well as similar signals observed in January 2004, were the first thermal anomalies observed at Shishaldin since August 2000. AVO saw no signs that an eruption was imminent. Shishaldin remained at Concern Color Code Yellow. AVO raised the Concern Color Code at Shishaldin from Green to Yellow on 3 May due to unusual seismic activity at Shishaldin during the previous week. Seismicity changed at the volcano from discrete earthquakes to more continuous ones. Tremor was observed for the first time since the most recent eruption ended in May 1999. Airwaves (acoustical waves traveling in air) accompanying earthquakes were recorded by the seismic network, suggesting that the source of seismicity had become more shallow. AVO reported that there were no indications that an eruption was imminent or even likely. Satellite data showed no significant increase in ground temperature at the volcano, nor had there been reports of increased steaming. However, AVO warned that activity at Shishaldin could increase rapidly and increased the frequency of their seismic-data analysis. During 17-24 March, the number of locatable low-frequency seismic events at Shishaldin greatly decreased in comparison to the previous week, returning to background levels. Shishaldin remained at Concern Color Code Green ("volcano is in quiet, "dormant" state"). During 10-17 May, the Alaska Volcano Observatory detected an increase in background seismicity at Shishaldin. There was an increase in the number of locatable shallow low-frequency earthquakes and several 2 to- 3-minute-long tremor-like signals that were inferred to be from a deep source. No thermal anomalies were visible on satellite imagery and there were no eyewitness reports of anomalous volcanic activity. Shishaldin remained at Concern Color Code Green ("volcano is in quiet, "dormant" state"). Shishaldin, during the few times it could be observed from Cold Bay, was seen to be continually active in September and into October. At 2215 on 16 September, NOAA's RV Millard Freeman, at 55.55°N, 163.82°W experienced rainfall that contained ash. This continued for 15 minutes while the ship was headed on course 250° true. The ash eruptions had apparently ceased by the end of October. Information Contacts: P. Sventek, USAF, Cold Bay; T. Miller, USGS, Anchorage. White steam was noted on 18 December (1200), 23 December (0900), and 27 December (0900). Information Contacts: P. Sventek, USAF, Cold Bay. White steam was noted at Shishaldin on 4-5, 11-12, 29-30, and 31 January. Activity during March remained low. 3 March (1100-1300): Steaming intermittently. 8 March (1700): Steaming quietly. 10 March (1700): Steaming quietly. 23 March (1800): Steaming weakly. 28 March (0600-0615): Steaming intermittently. 2 April (0600): Steaming weakly, snow on cone uniformly white. 6 April (1500): Appeared to be radially covered with ash. 14 April (0800-1800): Steaming intermittently. 25 April (2200): Steaming weakly. 27 April (1110): A faint, veil-like ash cloud was observed over the volcano. Within ten minutes the cloud had disappeared, the ash having settled on the cone, which appeared to be irregularly covered with radial ash sprays. A dark black streak was observed on the NW flank, extending 5-10 km from the summit to about the 300 m level where the slope of the cone diminishes to about 20°. The volcano was observed until 1900 and no further activity was noted. 30 April (1100-1800): The cone appeared to be ash-covered. Strong S winds had blown black ash sprays, more noticeable than the day before, onto the N flank. 14 May (1400): Dark ash visible on cone. 16 May (2000): Dark ash and steaming observed. 20 May (1900): NE flank from 1,600 to 2,500 m appeared to be extensively ash covered. 3 June (1100-1700): Volcano quiet; cone darkened by ash or exposed rock due to melted snow. 4 June (0800-2000): Steamed at irregular intervals and occasionally threw out ash that settled onto the slopes. The visible flanks appeared to be about 70% ash covered. 5 June (1400-2100): No activity noted. 6 June (1710-1730): No activity noted. 10 June (1430): Emitting black smoke intermittently. At 2000: the cone's upper 600 m, visible above the clouds, was extensively ash-covered; no activity noted. 11 June (1100-2000): Constantly emitting a weak steam plume. 12 June (0800-2000): Emitting a slight steam plume. 15 June (0500-0600, 2100): Steaming constantly. 22 June (1300): Peak covered by recent snows. NE flank showed ashfall. 27 June (1100-1400): Entire cone from the 1,500 m level to the summit was lightly to heavily ash-covered. 28 June (1700-1730): Steaming weakly. 2 July (1300-1400): Steaming steadily. 3 July (1200): Steaming weakly. 4 July (0500-2100): Steaming weakly. 6 July (1300-2100): Dark ash observed accumulating on N slope. 8 July (2100-2200): Emitting smoke and ash. 18 July (1500-2100): Steaming lightly. 23 July (1830-2100): Steaming heavily. Information Contacts: R. Dean, USAF, Cold Bay. 31 July (2045-2130): No activity. 2 August (1133-1145): No activity. 3 August (0755-2130): Light steam emission that intensified after 1600, turning to "smoke" after 2015. No new accumulations of ash were noted. 4 August (0730-0755): Steady plume of light steam. 12 August (1745-1800): Heavy steam blown down the W slope by winds. 22 August (0910-1205): No activity. 30 August (0800-0930): No activity; 90% of the ash accumulation had been blown away. 27 September (about 2025): A 1-minute burst of incandescent gas jetted from the crater and curved S. No further activity was observed during the next several hours. 28 September (0650): Shishaldin was steaming and emitting occasional ash clouds that were carried away by strong winds. No activity was observed during October. 9 November (0842-0915): Steaming, no ash accumulation on the cone. 17 November (1040-1135): Steaming, no noticeable ash accumulation. 24 November (1505-1630): Bursts of dense "smoke" were emitted at 5-minute intervals from the summit, then moved ~100 m down the E slope. 12 February (0905-1120): Steaming very lightly, no ash deposits. 22-24 February: No activity. Snow not discolored. A NOAA satellite image (figure 1) on 8 February at 1835 shows simultaneous 60-km plumes emerging from the summits of Shishaldin and Westdahl, about 50 km apart. No plume from Shishaldin is visible in images taken 8 hours earlier and 16 hours later (figure 2). No ashfall at Shishaldin can be seen in the latter image, but resolution is only 0.9 km and a light or moderate ashfall would probably not be visible. Figure 1. Enlargement of a portion of a NOAA 5 infrared image at 1835 on 8 February 1978 (0.9-km ground resolution), showing plumes, each ~60 km long, extending SE from both Westdahl and Shishaldin. Most of the Alaska Peninsula is visible, as is the coast of Alaska NW to the entrance to Kuskokwim Bay. The gray area off the coast is pack ice. Courtesy of Jürgen Kienle and NOAA. Figure 2. NOAA 5 satellite imagery, 5-9 February 1978, showing Unimak Island and vicinity. North orientations (arrow) are the same for each. A: (5 February 1978, 1036, infrared) Plume extends ~230 km S, rising to an estimated 8 km; black summit hot spot. B: (6 February 1978, 1141, infrared) Plume extends ~110 km SE; black summit hot spot. C: (7 February 1978, 1101, infrared) Plume at least 6 km high and ~160 km long, blown primarily SSE but some eastward shearing evident, probably by lower altitude winds. D: (8 February 1978, 1018, infrared) Plume extends 80 km SSE, at lower altitude than in C. E: (8 February 1978, 1018, visible, enlarged ~50% more than A-D) Weak plume curves SW to W about 100 km. Shishaldin is no longer active, 16 hours after its plume was visible in figure 1. The dark triangular area S of Westdahl is fresh ashfall, subtending an angle of about 95° and covering an area of ~300 km2. No ashfall is visible on Shishaldin. Courtesy of Jürgen Kienle and NOAA. Peninsula Airways pilots reported unusually strong ash emission during overflights on 14 or 15, and 27 February. Ashfall, usually confined to the summit area, was occurring on the upper half of the volcano. Information Contacts: G. Morgan, Peninsula Airways. Activity accompanied some of the eruption at Pavlof (about 150 km ENE) [see 6:9 Pavlof; Pavlof and Shishaldin are in different time zones]. At 1315 on 25 September, NOAA weather satellite imagery revealed plumes emerging from both Shishaldin and Pavlof (Pavlof was also emitting a plume 4 hours earlier when weather clouds had last allowed a clear view of the area). By 1445, Shishaldin's plume had reached an altitude estimated at 6-7.5 km based on cloud top temperatures calculated from infrared imagery. The plume remained evident on the imagery until 1845, drifting E.
However, no activity from Shishaldin accompanied the ejection of a new cloud from Pavlof at 1845. Satellite images next showed a plume from Shishaldin at 0830 the next morning, when plumes from both volcanoes could be seen drifting ESE. On the next image with clear visibility, at 1315, no activity could be seen from Shishaldin. Reports from pilots through this period were very sketchy, but Shishaldin was said to be "steaming hard." No unusual activity was observed after 26 September by pilots or on satellite imagery. Information Contacts: T. Miller and J. Riehle, USGS, Anchorage; S. McNutt and E. Hauksson, LDGO; W. Younker, NOAA/NESS, Anchorage. Anomalously large steam plumes with traces of ash have been noted for the past several months at Shishaldin by airline pilots and passengers. Diffuse ash layers extended from the volcano on 19 and 28 March, and steam and ash emission was seen on 6-7 May. Activity was less intense the next day, and had declined to minor steaming by 10 and 13 May. [See also 11:05]. The following supplements the preliminary report in 11:04. Large steam plumes that sometimes contained a little ash have been observed at Shishaldin since mid-March. The most vigorous activity was reported on 7 May, when a gray plume with streaks of dark ash extended 130 km S of the volcano at 3.6 km altitude. Moderate steaming was continuing in early June. On 19 March at about 1325, James Dickson saw a yellow-brown wispy plume rise about 90 m. A nearly transparent brownish layer that extended SW was visible for more than 50 km. MarkAir captain Jerry Chisum noted another ash layer from Shishaldin on 28 March. He reported that the volcano is usually steaming from the summit, but several times in the past several months he noticed anomalously large steam plumes with traces of ash. Chisum and several other pilots observed larger-than-normal steam and ash emission from Shishaldin on 6 and 7 May. On both days (at 1320) the plume rose at about a 45° angle to 3,400 m altitude (550 m above the summit) then drifted horizontally for at least 25 km. On 6 May the plume emission was continuous, but on the 7th the plume was puffing roughly every 20 minutes. Reeve Aleutian Airways captain Lee Goch flew within 25 km of the volcano on 6 May at 1350, noting that the plume appeared to contain traces of ash as it was pale gray. His photograph showed that the plume had drifted at least 40 km NE at about 3,600 m altitude. On 7 May at about 1300, Aleutian Air pilot Thomas Madsen observed a plume extending at least 130 km S at about 3,600 m altitude. The plume was distinctly gray with some streaks of dark ash. Less intense activity was reported by both Madsen and Goch on 8 May, when Madsen saw a grayish-white plume that drifted E. On 10 May, Reeve Aleutian captain Edward Livingston observed only minor steaming. Similar activity, with none of the steam rising above the summit, was seen by Goch on 13 May. Two days later, he saw a 90-m plume that drifted ~4 km NE. On 6 June at 1350, Livingston saw a white steam plume that rose 1100 m above the summit. The next day at the same time, the plume was 1400 m high; both drifted a few kilometers SE. On 9 June at 1340, the plume was only 180 m high but drifted 40 km E. Goch noted only minor summit steaming on 10 June. A steam plume up to 1,800 m above the volcano was reported by pilots on 28 October. That same day, observers from Izembeck National Wildlife Refuge reported a steam-and-ash plume that rose to 1,200 m above the summit and drifted SE. On 16 May a steam plume rose ~1,500 m above Shishaldin. Although large compared to typical day-to-day emissions, this is not unusual. Based on satellite imagery and pilot reports received by the U.S. Federal Aviation Administration, an eruption began at 1830 on 23 December. Between 1830 and 2000 on 23 December, pilots reported an ash plume as high as 10.5 km altitude (35,000 feet); prevailing winds carried the plume primarily N and NW. Analysis of a satellite image from 1912 showed a possible small ash plume extending ~50 km NW. Possible very light ashfall was reported at approximately 0130 on 24 December in Cold Bay, 90 km NE; this ash would have been carried by westerly low-altitude winds. An eruption on 23 December was first reported by pilots who observed an ash plume as high as 10.5 km altitude (BGVN 20:11/12). Possible very light ashfall was reported a few hours later 90 km away. Large steam plumes were reported in early January, and an intermittent "hot spot" was detected on AVHRR satellite imagery during 5-26 January, in the vicinity of the summit crater. This thermal anomaly may reflect unusually high temperatures in the vicinity of the continuously active fumaroles in the summit crater. AVO received no additional pilot reports or other observations of eruptive activity after 26 January. A visual observation of a small steam-and-ash plume was made by the U.S. National Weather Service at 1535 on 2 June from Cold Bay (90 km NE); the plume rose 300-450 m above the summit and drifted ~8 km downwind to the N. Installation of a seismic network of six stations was completed in July; testing and data collection to determine background seismicity is expected to be completed by mid-November. During the first week of February, National Weather Service personnel in Cold Bay, 93 km ENE of Shishaldin, observed anomalous steaming. On 9 February a vigorous steam plume rose as high as 1,830 m above the vent and a long plume drifted downwind. Satellite imagery taken that day showed a thermal anomaly at the vent in addition to the steam plume. The steam activity decreased during the week, becoming only light puffs rising a few meters above the vent; however, the thermal anomaly at the vent persisted. A newly installed seismic net recorded slightly elevated seismicity beginning at the end of January. The hazard status was raised to Yellow on 18 February due to the persistence of the thermal anomaly and the identification of low-level seismic tremor. Pilots and ground observers reported a large steam plume rising to 5,800 m on 18 February. No ash was detected on satellite imagery. Cloudy weather precluded ground observations for most of the following week. Shishaldin volcano, located near the center of Unimak Island in the eastern Aleutian Islands, is a spectacular symmetrical cone with a basal diameter of approximately 16 km. A small summit crater typically emits a noticeable steam plume with occasional small amounts of ash. Shishaldin is one of the most active volcanoes in the Aleutian volcanic arc, situated near that part of the arc where the maximum rate of subduction occurs. It has erupted at least 27 times since 1775. Major explosive eruptions occurred in 1830 and 1932, and eight historical eruptions have produced lava flows. Steam and minor ash emission began in March 1986 and continued intermittently through mid-February, 1987. A poorly documented short-lived eruption of steam and ash, perhaps as high as 10 km, occurred in December 1995 (BGVN 21:01). Fresh ash was noted on the upper flanks and crater rim but no specific eruptive event was identified for the deposits. Information Contacts: Alaska Volcano Observatory, a cooperative program of a) U.S. Geological Survey, 4200 University Drive, Anchorage, AK 99508-4667, USA (URL: http://www.avo.alaska.edu/), b) Geophysical Institute, University of Alaska, PO Box 757320, Fairbanks, AK 99775-7320, USA, and c) Alaska Division of Geological & Geophysical Surveys, 794 University Ave., Suite 200, Fairbanks, AK 99709, USA. Low-level seismicity and a thermal anomaly visible in satellite imagery continued at Shishaldin during March, preceding Strombolian eruptions on 17 April. On many days no observations were obtained due to bad weather. A new seismic net at Shishaldin recorded elevated seismicity beginning near the end of January. On 9 February a thermal anomaly appeared on satellite imagery and vigorous steam plumes were reported through the next week (BGVN 24:02). No ash was detected on the satellite imagery. Low-level tremor prompted the Alaska Volcano Observatory (AVO) to raise the Level of Concern Color Code to Yellow on 18 February. The tremor subsequently diminished, but seismicity remained above normal. National Weather Service observers in Cold Bay, 90 km NE, reported that no steam plume was present during the first week of March, but that the upper summit was snow-free. Apparently, heating in the summit area caused the snow to melt. A shallow M 5.0 earthquake ~14 km SW of Shishaldin on 4 March was followed by hundreds of small aftershocks that persisted until late in the month. Seismic activity, chiefly strong tremor, substantially increased above previous levels at 0800 on 7 April, causing AVO to raise the hazard status to Orange. Weather in the area was overcast with haze, preventing views of the summit area. The strong tremor declined by the afternoon and returned to previous levels. Tremor remained steady from 8 April without significant changes through 12 April, when the hazard status was decreased to Yellow. The thermal anomaly observed in satellite imagery persisted. On 12 April a M 4.5 earthquake struck W of the volcano; aftershocks followed. Tremor increased markedly late on 13 April. This tremor episode lasted over one day and decreased somewhat for the next three days. AVO again raised the hazard status to Orange on 14 April. AVO staff flying with Alaska State Troopers saw a minor Strombolian eruption at 1700 on 17 April. Incandescent blocks and spatter rose as high as 200 m above the vent, but at that time no lava had come over the crater rim. On the morning of 18 April, National Weather Service observers NW of the volcano both in Cold Bay and on a ship saw incandescent lava at the summit and snow melt running down the NW flank. A small steam plume with little or no ash developed as hot lava contacted snow at the summit. Tremor remained elevated. On 19 April at 1145 a pilot saw a steam-and-ash plume that reached ~9 km altitude. In accord with this observation, tremor amplitudes increased dramatically after 1133 in the wake of a steady, two-day tremor increase. Observers interpreted these as signs of a significant eruption and raised the hazard status to Red. By early afternoon the eruption column reached at least 13.7 km altitude. The eruption lasted about 7 hours with one ash plume at higher elevations moving N and another, at lower elevations, S. Aviation warnings ("Graphic Volcanic Meteorological Impact Statements") for 0410-1610 on 19 April indicated two separate areas to avoid; one area spread ~300 km N over an elliptically shaped zone and the other, ~500 km S over a broadly spreading pattern that also included a lobe reaching ~375 km NW of Shishaldin (to Chignik). Late on the night of 19 April seismic tremor decreased substantially, but the Strombolian eruption continued at moderate levels. On 20 April at about 0345, seismicity abruptly and significantly declined, indicating that explosive activity had subsided; still, satellite imagery after 0650 (1450 GMT) revealed a summit-crater thermal anomaly. Authorities decreased the hazard status to Orange. Seismic activity increased again about 1600. The increase in seismicity strengthened at about 2300 and on the morning of 21 April reached levels similar to those recorded in the hours before the explosive eruption on 19 April, and the hazard status returned to Red. Moderate Strombolian eruptions were thought to be occurring, though at the time satellite imagery failed to show a major ash cloud. A moderate Strombolian eruption occurred through the night of 21 April. Seismicity became elevated and a very large thermal anomaly became visible on satellite imagery. Lava fountains shot tens of meters above the summit and satellite imagery indicated occasional steam and clouds of sparse ash extending for less than 50 km at altitudes under 5,000 m.
Strombolian eruptions, including forceful steam-and-ash plumes, peaked at Shishaldin on 19 April (BGVN 24:03) and continued well into May. The 19 April plume rose to 15-20 km and various components were carried in different directions (figure 3). As discussed further in the Atmospheric Effects section below, scientists studying atmospheric aerosols with a variety of satellite-based instruments as well as ground-based lidar detected atmospheric anomalies through at least late May; some at great distances from the volcano. The initial anomalies seen by satellite were clearly linked to the 19 April eruption, but at longer time intervals after the eruption and at greater distances from the source, this became less certain. Figure 3. Detailed view of the spreading eruption cloud from Shishaldin on 19 April, taken from a series of images taken by the GOES 10 satellite (channel 1). Unimak Island is outlined. The top frame was imaged at 1200; the following frames at subsequent half-hour increments. The cloud labeled "A" was at higher altitude and moved N; cloud "B" was at lower altitude and moved S. Courtesy of NOAA/NESDIS. Moderate Strombolian eruptions and elevated seismicity continued following the initial forceful eruption and through the night of 22 April, . Lava fountaining to about 150 m above the summit coincided with satellite images of occasional steam and sparse ash clouds. These clouds extended ~48 km at altitudes less than 4.6 km. Satellite data during the first week of May showed a few small ash-poor plumes, but no thermal anomalies or other indicators of significant eruptive activity were seen. The next significant reported event, on 13 May, occurred after a night with a small thermal anomaly in satellite imagery and weak tremor. The crew of a National Weather Service boat at the N end of False Pass, 30 km NE from the volcano, saw three puffs at ~1025. A plume rose 300 m above the summit. A pilot's report at 1155 confirmed the activity. Poor weather conditions may have thwarted observers' ability to see eruptive activity the following week and none was reported. At 2311 on 24 May a pilot reported a plume that rose to 6.1 km. Ash-rich steam in a plume was visible in satellite imagery at 1459 on 25 May, extending 160 km S from Shishaldin at an estimated altitude of ~4.6 km. One of the most active volcanoes of the Aleutian Islands, the glacier-covered Shishaldin lies at the westernmost end of three large stratovolcanoes on the eastern half of Unimak Island. The volcano's frequent explosive activity has primarily consisted of Strombolian ash eruptions vented from its small summit crater, and occasional lava flows. The historical record of such events goes back to the 18th century. Information Contacts: Alaska Volcano Observatory (AVO), a cooperative program of a) U.S. Geological Survey, 4200 University Drive, Anchorage, AK 99508-4667, USA (URL: http://www.avo.alaska.edu/), b) Geophysical Institute, University of Alaska, PO Box 757320, Fairbanks, AK 99775-7320, USA, and c) Alaska Division of Geological & Geophysical Surveys, 794 University Ave., Suite 200, Fairbanks, AK 99709, USA; NOAA/NESDIS Operational Significant Event Imagery Support Team, Interactive Processing Branch E/SP22, 5200 Auth Road, Camp Springs, MD 20746, USA (URL: https://www.nnvl.noaa.gov/). The eruption that began in mid-April (BGVN 24:03 and 24:04) ended in late May following blasts that sent ash plumes to 6 km altitude. No eruptive activity was observed or reported the week of 15-21 May, but the hazard status remained at Yellow due to persistent low-level seismicity and a summit thermal anomaly. A pilot report at 2311 on 24 May indicated an eruption plume up to 6 km altitude. A narrow ash-rich plume was seen in satellite imagery at 0659 on 25 May, extending about 160 km S from Shishaldin at an estimated altitude of 4.5 km. Following these observations the hazard status was raised to Orange, indicating that the volcano was in eruption. The plume continued to be seen on imagery at 1530, extending 175 km S, with low to moderate levels of seismicity being recorded. Satellite imagery at 1000 on 26 May indicated that a narrow ash-rich plume continued to be emitted from the volcano, extending ~110 km SE at altitudes of up to 6 km; a pilot report at 1603 on 25 May indicated an ash-rich plume at ~5.5 km altitude. The plume seen on satellite imagery at 1645 extended at least 160 km ESE. Seismicity was at low to moderate levels beneath the volcano. Satellite imagery during the night of 26-27 May showed a continuous narrow ash-rich plume extending ~800 km ESE from the volcano at altitudes of 4.5-6 km until about 0100 on 27 May. After that time the plume became detached from the volcano and had diminished significantly by 0300. A small thermal anomaly in the summit crater was visible in a satellite image at 0908. A ground crew from AVO on the N flank of the volcano reported only white steam from the summit crater during 28 May. Seismicity remained low through 1 June, and although the top of the volcano was visible no ash plume or thermal anomaly was seen in satellite imagery. The Level of Concern Color Code was therefore downgraded to Yellow. Although low-level seismicity continued, on 18 June AVO lowered the Level of Concern Color Code to Green based on the decline in activity over the previous month. 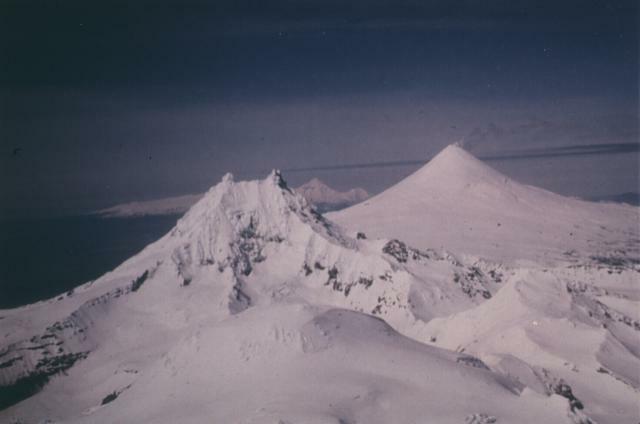 The Alaska Volcano Observatory (AVO) reported on 21 January 2000 that investigations of recent seismic data had revealed evidence for small explosions at Shishaldin. Later detailed study of the seismic records showed that the activity may have begun in as early as late September. The numbers of explosions varied from several to over 200/day, but no steam or ash plumes were observed by airborne or ground observers. Also, no thermal anomaly was observed in satellite imagery, indicating that lava had not reached the surface. It was thought that the explosions were phreatic, caused by the flashing of water to steam; these events may represent a local hazard within a few hundred meters of the vent but do not pose a hazard to aircraft. Small explosions continued at a similar rate through 28 January. Small low-frequency seismic events, present at Shishaldin since June 1999, gradually increased in amplitude after 28 January, with a noticeable increase during 2-3 February. Seismic data continued to show the presence of small phreatic explosions. Reports of steam plumes were received during the week ending on 2 February, with heights reaching as high as ~900 m above the summit. However, no thermal anomaly was observed in satellite imagery and no seismic tremor was identified; both were seen prior to the last eruptive episode in April and May 1999 (BGVN 24:03, 24:04, 24:08). Due to the increased activity, AVO raised the Level of Concern Color Code to Yellow on 3 February, indicating that the volcano is restless and an eruption may occur. No appreciable number of seismic events were detected after 4 February; that was also the last day that small explosions were observed. Small low-frequency seismic events continued through 11 February, but at a slower rate and slightly lower amplitude. By 18 February seismic activity had declined significantly with no thermal anomalies or observations of unusual activity, so the hazard status was changed back to Green, indicating normal seismicity and surface activity. Small low-frequency seismic events and very low-level tremor was recorded through 3 March, although at or below the levels observed in the months prior to the 19 April 1999 eruption. Low-level seismicity continued through the end of March. Vigorous steaming was reported in the second half of March, but no thermal anomaly observed in satellite imagery. The Alaska Volcano Observatory (AVO) reported on 11 August that recent satellite data indicated a weak thermal anomaly at Shishaldin's summit, although no known seismic activity occurred above background levels in the area. Pilot reports did not disclose any noticeable change in steam emission from the summit crater. Accordingly, the AVO decided to keep the Level of Concern Color Code for Shishaldin at Green. After 11 August, clear days allowed unobstructed remote sensing, and satellite observations, which suggested no further thermal anomaly. On 18 August, AVO issued an update stating that new seismic data analysis showed several small explosions occurring coeval with the thermal anomaly reported on 11 August. These explosions were similar to those observed throughout 1999 and in early 2000 (BGVN 24:02-24:04, 24:08, and 25:02). The thermal anomaly and seismic disturbances did not recur in the remainder of August, however, so the hazard status remained Green. 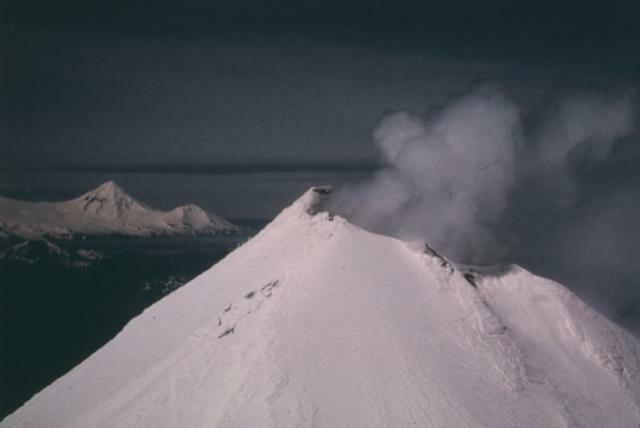 During mid-May 2002, the Alaska Volcano Observatory (AVO) detected an increase in background seismicity at Shishaldin that lasted for about one week. There was an increase in the number of located shallow low-frequency earthquakes and several 2-3-minute-long tremor-like signals that were inferred to be from a deep source. No thermal anomalies were visible on satellite imagery and there were no eyewitness reports of anomalous volcanic activity. Shishaldin remained at Concern Color Code Green ("volcano is in quiet, "dormant" state"). The last reported activity at Shishaldin included a thermal anomaly and small explosions during August 2000 (BGVN 25:08). The last report on Shishaldin (BGVN 27:05) described an increase in backround seismicity in mid-May 2002. Specifically, there was an increase in shallow low-frequency earthquakes and several tremor-like signals. However, because there were no thermal anomolies visible on satellite imagery, and no reports of anomalous volcanic activity, Shishaldin remained at Concern Color Code Green. Activity during August 2002. On 16 August 2002, the Alaska Volcano Observatory (AVO) received notification of a pilot report, via the National Weather Service (NWS) Alaska Aviation Weather Unit (AAWU), of volcanic activity. The pilot report indicated that Shishaldin appeared to be erupting, producing steam and dark clouds to 3.2 km altitude that moved to the NW-SE. A NWS observer in Cold Bay, ~ 100 km E of the volcano, reported a steam-rich plume coming from Shishaldin. As per operating policy, the AAWU issued an "eruption SIGMET" advising the aviation community of the possibility of airborne volcanic ash. Upon receiving the pilot report, the AVO immediately analyzed seismic and satellite data and determined that Shishaldin was at a normal background state and had not erupted. Further discussions with the observer in Cold Bay indicated that the steam plume was not uncommon. The last significant ash-producing eruptions of Shishaldin occurred during April-May 1999. Since that time, low-frequency seismic events and occasional steam plumes have characterized activity at the volcano. Shishaldin remained at Concern Color Code Green. Activity during April-May 2004. The AVO raised the Concern Color Code at Shishaldin from Green to Yellow on 3 May due to unusual seismicity during the previous week. Seismicity changed from discrete earthquakes to more continuous ones, and tremor was observed for the first time since the most recent eruption ended in May 1999. Airwaves (acoustical waves traveling in air) accompanying earthquakes were recorded by the seismic network, suggesting that the source of seismicity had become more shallow. Satellite data showed no significant increase in ground temperature, nor had there been reports of increased steaming. However, AVO warned that activity at Shishaldin could increase rapidly and increased the frequency of their seismic-data analysis. Seismic unrest continued during 30 April to 7 May, and was characterized by sequences of volcanic earthquakes and seismic tremor. The number of airwaves recorded by the seismic network diminished in comparison to the previous week, with weaker signals recorded. Thermal anomalies at the summit were observed on satellite imagery under optimal viewing conditions. Retrospective analysis confirmed that these data, as well as similar signals observed in January 2004, were the first observed since August 2000. AVO saw no signs that an eruption was imminent. Shishaldin remained at Concern Color Code Yellow throughout the month. During 8-14 May seismic unrest continued, characterized by sequences of volcanic earthquakes, small explosions, and seismic tremor. A weak thermal anomaly observed at the summit on 11 May was similar to those detected occasionally since January 2004. On 16 May, a pilot reported an ash plume that rose ~ 300 m above the volcano's summit. Satellite imagery from 17 May (figure 4) showed a vigorous plume, possibly containing small amounts of ash, emanating from the summit. Seismic unrest during 14-21 May was characterized by weak seismic tremor and small explosions, and during 21-28 May also included occasional discrete low-frequency earthquakes. In addition, small explosion signals were recorded by a pressure sensor. Meteorological clouds obscured views of the volcano. Satellite data acquired at 0823 UTC (0023 ADT) on 29 May showed that the crater to continue to be warmer than background temperatures. Figure 4. Shishaldin as depicted by an ASTER false color (image with bands 3, 2, and 1 as RGB and cloud/plume detail added with a semi-transparent band 4) taken 17 May 2004. The summit crater is shrouded by clouds, but a small plume that appears to contain ash is blowing toward the N. Dark streaks on the northern flanks may be partly from a light dusting of ash; however, other dark streaks appear as darker features melting through the snow. Courtesy of AVO. Activity during June-July 2004. Seismic unrest continued during 18 June-2 July, characterized by weak seismic tremor and occasional discrete low-frequency earthquakes. 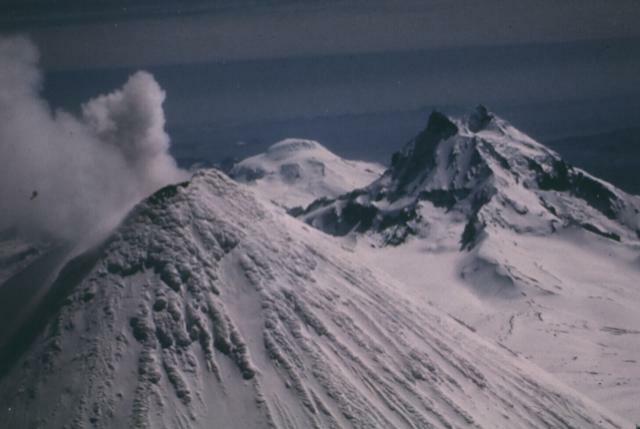 At roughly 0800 ADT on 24 June, pilots reported steam rising at least 100 m above Shishaldin's cone. Around that time, a possible weak thermal anomaly was visible on satellite imagery. Shishaldin remained at Concern Color Code Yellow. Previously reported activity at Shishaldin included the onset of tremor and some unusual earthquakes. For at least one day in July 2004 small ash plumes rose above the summit (BGVN 29:06). In 2008, only one instance of an ash plume was reported. According to the Anchorage VAAC a pilot reported a small ash plume at an altitude of 3 km on 12 February. The ash plume was not confirmed by satellite imagery or ground observations. AVO did not report any unusual activity during this time. Shishaldin typically emits a relatively steady steam plume, as seen on 2 September 2008 (figure 5). Figure 5. Shishaldin and a steam plume at sunset taken from a helicopter on 2 September 2008. Image courtesy of Cyrus Read and Alaska Volcano Observatory / U.S. Geological Survey. Information Contacts: Alaska Volcano Observatory (AVO), a cooperative program of the U.S. Geological Survey, 4200 University Drive, Anchorage, AK 99508-4667, USA (URL: http://www.avo.alaska.edu/), the Geophysical Institute, University of Alaska, PO Box 757320, Fairbanks, AK 99775-7320, USA, and the Alaska Division of Geological and Geophysical Surveys, 794 University Ave., Suite 200, Fairbanks, AK 99709, USA; Anchorage Volcanic Ash Advisory Center (VAAC), Alaska Aviation Weather Unit, NWS NOAA US Dept of Commerce, 6930 Sand Lake Road, Anchorage, AK 99502-1845, USA (URL: http://www.ssd.noaa.gov/). Shishaldin, located on Unimak Island, is one of the most active volcanoes within the Aleutian Islands (figure 6). It is also the tallest volcano within the Aleutians, and has a symmetric cone and a basal diameter of 16 km. In this Bulletin report, we summarize activity at Shishaldin from January to December 2009 and from January 2014 to March 2015. During 2009, Shishaldin emitted steam plumes, generated thermal anomalies, and underwent several episodes of tremor in what was considered to be a questionable eruption. From 2014 through March 2015, Shishaldin experienced elevated surface temperatures, steam emissions, and starting in March 2014, an ongoing low-level lava eruption within the summit crater that occasionally deposited ash on the upper flanks. As of March 2015, this low-level eruption continued. Considerable information in this report was found in material released by the Alaska Volcano Observatory (AVO). For activity in 2009, we drew heavily on McGimsey and others (2014). Our last Bulletin report (BGVN 33:08) discussed activity at Shishaldin in February 2008, when a pilot reported a 3 km altitude ash plume. Figure 6. Map showing the location of Shishaldin. The volcano is located near the center of Unimak Island, and is the tallest peak and one of the most active volcanoes within the Aleutians Islands. False Pass, located 38 km to the NE, is the closest town. Map is courtesy of Alaska Volcano Observatory and Alaska Division of Geological & Geophysical Surveys. January-December 2009. This section of the report summarizes activity at Shishaldin throughout 2009. According to AVO's web page, activity began on 5 January (± 1 month) and ended on 16 August and was characterized as a questionable eruption. According to McGimsey and others (2014, a report cited by the AVO), increased seismicity, small steam plumes as well as thermal anomalies characterized activity during 2009. Steam plumes are considered normal at Shishaldin according to McGimsey and others (2014). McGimsey and others (2014), stated that there was an increase in observed thermal anomalies at Shishaldin in early January 2009. On 5-6 January, an AVHRR satellite image of Unimak Island showed a thermal anomaly centered on Shishaldin's summit crater. The anomaly reached a 2-pixel size on 6 January. There was also a slight increase in seismicity. These observations indicated a clear departure from background conditions. On 6 January, AVO increased Shishaldin's Aviation Color Code (ACC) from Green to Yellow and the Volcano Alert Level from Normal to Advisory. That day, pilots and ground observers reported a constant steam plume rising ~300 m above the summit and drifting 16-25 km SE (McGimsey and others, 2014). Over the next few days, AVO continued observing a thermal anomaly in satellite images. On 7 January 2009, AVO received both a pilot report and observations from Cold Bay (93 km to the NE, figure 6) noting a vigorous steam plume rising from Shishaldin. On 8 January, satellite images showed a steam-filled crater with no ash on the flanks (McGimsey and others, 2014). AVO's 9 January 2009 Weekly Update stated "Although detection of a thermal anomaly is rare at this volcano, it is not certain that this unrest will lead to an eruption. A thermal anomaly was observed in the months leading up to the last significant eruption at Shishaldin [that occurred] in 1999; this fact, combined with the likelihood that an eruption at Shishaldin could occur with little or no seismic precursors, drove AVO's decision to raise the Color Code and Alert Level." On 11 January 2009, a photo captured by a pilot showed pulsing steam plumes. Two days later, AVO seismologists identified a minor, low-amplitude tremor that persisted for a few weeks. According to McGimsey and others (2014), during the next few weeks, seismicity remained low, a few thermal anomalies were detected, and steaming was observed. According to AVO's 13 February 2009 Weekly Update, a very weak thermal anomaly was detected on 3 February. The Update went onto say that on 11 February, the ACC was downgraded to Green and the Volcano Alert Level lowered to Normal, due to Shishaldin's return to background conditions. That Update also mentioned that seismic activity had remained low, since decreasing to background levels in late December 2008. McGimsey and others (2014) reported that over the next seven weeks (mid-February to early April 2009) occasional thermal anomalies were observed along with continuous low-level tremor, which was not considered unusual. On 7 April, a pilot reported that he saw Shishaldin steaming more vigorously than he had previously observed during his weekly flights past Shishaldin over the last 16 months. That day, a thermal anomaly was also observed in satellite imagery (McGimsey and others, 2014). On 20 April 2009, thermal activity at Shishaldin's summit spiked based on multiple thermal anomalies containing saturated pixels observed in satellite imagery (McGimsey and others, 2014). According to McGimsey and others (2014), these anomalies indicated high ground temperatures (greater than 300°C). This level of thermal activity was last seen before Shishaldin's eruption in 1999. On 5 May, a pilot reported steaming from Shishaldin and a passenger on a different flight reported dark-colored linear features on the N side of the summit. According to McGimsey and others (2014), these linear features were later interpreted as minor streams of dirty water trailing downslope. McGimsey and others (2014) reported that throughout June 2009, thermal anomalies were detected on about one third of days, with a particularly strong anomaly being recorded on 9 June. No unusual seismic activity was noted. On the night of 25 June, an ASTER thermal infrared satellite image captured a thermal anomaly and a 22 km-long steam plume extending E-NE from Shishaldin. Then on 29 June, an observer in Cold Bay (93 km NE) reported increased steaming at Shishaldin over the past few days. In the first week of July 2009, thermal anomalies at Shishaldin increased in intensity, with a return of saturated pixels, indicating high ground temperatures. On 10 July, AVO increased the ACC from Green to Yellow and the Volcano Alert Level from Normal to Advisory, due to the increase and continued presence of thermal anomalies. Seismicity and deformation did not change significantly during this time and satellite data did not show any noteworthy SO2 emissions. On 13 July, emissions were detected in satellite imagery and a pilot reported a steam plume rising 600 m above Shishaldin and moving NW. On 15 July, the satellite-based Ozone Monitoring Instrument (OMI) detected a small cloud rich in SO2 that originated from Shishaldin. For the rest of July and the first half of August 2009, steaming was observed from Shishaldin's summit, when weather permitted. Thermal anomalies were also detected in satellite images during August; one example was on 16 August. In mid-September 2009, pressure sensors at Shishaldin detected anomalous airwaves. According to McGimsey and others (2014), the airwaves could be indicative of minor explosions; however, in retrospective analysis of the data collected by the pressure sensors, the airwaves were found to be a common occurrence and linked to episodic gas bursts (examples of which were seen during 2003-2004). On 19 October 2009, due to the continued absence of thermal anomalies, a decrease in steam emissions and seismicity considered within background levels, AVO lowered the ACC to Green and the Volcano Alert Level to Normal. Besides a weak thermal anomaly detected on 2 November, Shishaldin remained quiet for the remainder of 2009. Non-eruptive interval during 2010-2013. AVO reported no unusual activity at Shishaldin between the years 2010 and 2013. In 2010, 2012 and 2013, AVO uploaded photos of Shishaldin, some of which showed the volcano emitting steam (figure 7). Figure 7. Photograph of Shishaldin emitting a steam plume on 14 September 2013. The photograph was taken from Korpiewski (2013). Activity during January 2014-March 2015. According to AVO's website, increased activity was detected on 28 January 2014 at Shishaldin. A low-level lava eruption within the summit crater then began in March 2014 and continued through March 2015. In addition to the ongoing eruption, there were also instances of heightened activity, one such example occurring around 28 October 2014, after AVO noted several days of elevated tremor and stronger thermal anomalies. AVO provides a description that synthesizes Shishaldin activity from late January 2014 through March 2015 on their website (as accessed on 1 May 2015). What follows is a quote of that description. For greater detail on activity during this interval, please see AVO's Weekly and Daily reports. Any information added to the quote by Bulletin editors has been [bracketed]. Bulletin editors also included pictures, depicting certain events that were described in the quote. "On January 30, 2014, the Alaska Volcano Observatory raised the Volcano Alert Level to ADVISORY and the Aviation Color Code to YELLOW for Shishaldin, based on satellite observations of the previous days [figure 8]. Satellite observations included increased surface temperatures in the summit crater, as well as increased emissions of steam. Similar levels of unrest were last observed during 2009, and did not result in an eruption." Figure 8. Satellite image of Shishaldin on Unimak Island captured at 0838 UTC on 30 January 2014. The image shows the elevated surface temperatures in the summit crater of Shishaldin. According to the AVO caption for this image, "This mid-infrared image is scaled so that warm values are bright white and cold values (like high clouds are dark). The elevated surface temperatures are visible as the white pixels within the yellow circle that indicates the location of Shishaldin." Image was created by Dave Schneider and is courtesy of Alaska Volcano Observatory/ U.S. Geological Survey. "For the next week, persistent elevated surface temperatures were visible in satellite imagery of the summit crater during clear-weather intervals. On February 7, a possible volcanic cloud was observed in satellite images beginning around 1545 UTC (6:45 AKST). This cloud may have resulted from a small explosive event at the volcano. The event was small enough that it was not detected by the one working seismic station near the volcano, but it appears to coincide with a signal recorded by a nearby tiltmeter. Satellite images suggest that the cloud may have reached as high as [7.6 km above sea level], was ash-poor, and short-lived. There was no evidence of elevated surface temperatures observed in satellite data immediately following this event, suggesting it was primarily a gas event and very little to no hot material was produced or deposited on the flanks of the volcano. "During the week of April 11, minor ash deposits extending several hundreds of meters from the summit crater were observed in satellite imagery. Infrasound signals from Shishaldin were occasionally detected at sensors located at Dillingham [585 km to the NE] and Akutan Island [145 km to the SW]. "Throughout April, May, June, and July, elevated surface temperatures consistent with low-level eruptive activity in the summit crater were observed in satellite data, and small explosion signals were detected in seismic data. Occasional clear webcam views often showed minor steaming. An AVO overflight on August 10 showed hot, glowing material in the crater [figure 9]. On August 13, AVO received a pilot report of a low-level plume. [On 23 August, a pilot reported a steam-and-ash plume rose ~300 m above the summit and drifted NE.] Similar levels of activity continued throughout August, September, and October." Figure 9. Photograph of incandescent material within Shishaldin's steaming summit crater and steam being emitted. This aerial photograph was captured on 10 August 2014 and shows ash deposited on the snow (in the left of the photo). Photo was captured by Cyrus Read and is courtesy Alaska Volcano Observatory/ U.S. Geological Survey. "On October 28, 2014, AVO noted an increase in intensity over the past several days, including elevated seismic tremor and stronger thermal anomalies. New deposits of ash and ballistics darkened the summit area, and the activity was also recorded on infrasound stations at Akutan and Dillingham. [On 26 October, clear webcam images revealed tephra deposits at the summit. The 28 October 2014 VAN stated that these new deposits indicated, '…the activity was energetic enough to eject material from a depth of several hundred meters (~600 ft) within the summit crater.'] This period of increased tremor lasted for several further days. "On November 24, seismic activity at Shishaldin again increased, . . .. This increased seismicity declined by November 27, but remained above background. [AVO's 28 November 2014 Weekly Update said, 'Although the level of seismic activity has declined during the week, it is likely that a low-level lava eruption is ongoing within the summit crater of the volcano.'] Weak, but above background seismicity, along with weakly elevated crater surface temperatures, continued in December 2014 and January 2015. "In late January 2015, strongly elevated temperatures were observed in satellite images, consistent with active lava within the crater. [AVO's 23 January 2015 Weekly Update stated, 'Activity [over the past week was] consistent with what we have observed at Shishaldin during the past several months, which includes lava effusion in the crater with occasional production of small amounts of ash restricted to the volcano's upper flanks.'] A wispy, low-level ash emission was observed in webcam images on February 2, 2015. "Throughout February and March 2015, clear satellite views often show elevated surface temperatures at the crater, seismicity remained above background, and low-level steam emissions were frequently seen in webcam images. It is likely that low-level eruptive activity continued within the summit crater." Schneider, D., Alaska Volcano Observatory/ U.S. Geological Survey, 2014, URL: http://www.avo.alaska.edu/images/image.php?id=57691, date accessed: 13 May 2015. Information Contacts: Alaska Volcano Observatory (AVO), a cooperative program of the U.S. Geological Survey, 4200 University Drive, Anchorage, AK 99508-4667, USA (URL: http://www.avo.alaska.edu/), the Geophysical Institute, University of Alaska, PO Box 757320, Fairbanks, AK 99775-7320, USA, and the Alaska Division of Geological and Geophysical Surveys, 794 University Ave., Suite 200, Fairbanks, AK 99709, USA; Anchorage Volcanic Ash Advisory Center (VAAC), Alaska Aviation Weather Unit, and NWS NOAA US Dept of Commerce, 6930 Sand Lake Road, Anchorage, AK 99502-1845, USA (URL: http://vaac.arh.noaa.gov/). The beautifully symmetrical volcano of Shishaldin is the highest and one of the most active volcanoes of the Aleutian Islands. The 2857-m-high, glacier-covered volcano is the westernmost of three large stratovolcanoes along an E-W line in the eastern half of Unimak Island. The Aleuts named the volcano Sisquk, meaning "mountain which points the way when I am lost." A steady steam plume rises from its small summit crater. Constructed atop an older glacially dissected volcano, it is Holocene in age and largely basaltic in composition. Remnants of an older ancestral volcano are exposed on the west and NE sides at 1500-1800 m elevation. There are over two dozen pyroclastic cones on its NW flank, which is blanketed by massive aa lava flows. Frequent explosive activity, primarily consisting of strombolian ash eruptions from the small summit crater, but sometimes producing lava flows, has been recorded since the 18th century. Beget J E, Nye C J, Schaefer J R, Stelling P L, 2003. Preliminary volcano-hazard assessment for Shishaldin volcano, Alaska. Alaska Dept Nat Resour Div Geol Geophys Surv, Rep Invest, 2002-4: 1-28. Fournelle J H, 1988. The geology and petrology of Shishaldin volcano, Unimak Island, Aleutian arc, Alaska. Unpublished PhD thesis, John Hopkins Univ, 507 p.
Nye C J, Keith T E C, Eichelberger J C, Miller T P, McNutt S R, Moran S, Schneider D J, Dehn J, Schaefer J R, 2002. The 1999 eruption of Shishaldin volcano, Alaska: monitoring a distant eruption. Bull Volcanol, 64: 507-519. Petersen T, McNutt S R, 2007. Seismo-acoustic signals associated with degassing explosions recorded at Shishaldin Volcano, Alaska, 2003-2004. Bull Volcanol, 69: 527-536. Vergniolle S, Caplan-Auerbach C, 2006. Basaltic thermals and subplinian plumes: constraints from measurements at Shishaldin volcano, Alaska. Bull Volcanol, 68: 611-630. There is data available for 49 Holocene eruptive periods. Remarks: Regions 15 km east and 30 km northwest of Shishaldin exhibit uplift that is temporally correlated with the 2004 eruption of Shishaldin. Reference List: Gong et al. 2015. Gong, W., Meyer, F. J., Lee, C. W., Lu, Z., & Freymueller, J., 2015. Measurement and interpretation of subtle deformation signals at Unimak Island from 2003 to 2010 using weather model- assisted time series InSAR. J. Geophys. Res., 120(2), 1175-1194. This closeup aerial view of the summit of Shishaldin volcano shows its almost constantly steaming crater, with its high point on the south rim. Progromnoi volcano, part of the Westdahl volcanic complex at the western end of Unimak Island, forms the sharp-topped peak in the left distance. Photo Clayton and Marcia Brown, 1987 (courtesy of John Reeder, Alaska Div. Geology & Geophysical Surveys). Often compared to Mount Fuji of Japan, the symmetrical Shishaldin volcano, located on central Unimak Island in the Aleutians, rises 2857 m above sea level. The volcano has a summit crater that emits a nearly continuous plume of steam. Shishaldin is the highest and one of the most active volcanoes of the Aleutian Islands. It has produced frequent strombolian eruptions, sometimes with lava flows, since the 18th century. Photo by Chris Nye (Alaska Division of Geological & Geophysical Surveys, Alaska Volcano Observatory). There are no samples for Shishaldin in the Smithsonian's NMNH Department of Mineral Sciences Rock and Ore collection. Large Eruptions of Shishaldin Information about large Quaternary eruptions (VEI >= 4) is cataloged in the Large Magnitude Explosive Volcanic Eruptions (LaMEVE) database of the Volcano Global Risk Identification and Analysis Project (VOGRIPA).